Guangzhou Zhongke computer equipment Co., Ltd. was founded in Huadu Xinhua in March 2009. It is now relocated to No. 1 Baofeng Road, Ao tou Town, Conghua District, Guangzhou, and the industrial base of the Pearl Industrial Park in Conghua District, and renamed Guangzhou Zhongwei Technology Co., Ltd. (hereinafter referred to as Zhongwei Technology). The traffic is smooth and runs through Guangzhou New International Airport and Beijing Hong Kong Macao expressway, Beijing Guangzhou railway and other transportation lines. 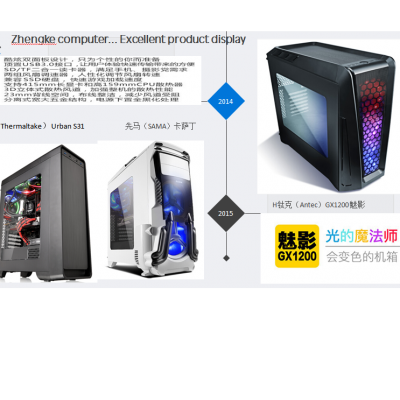 Zhongwei technology has been devoted to the research and development of computer peripherals such as computer chassis, power supply, fans, mouse and so on. The construction area of the plant is 30000 square meters, with nearly 500 employees. It has a team of high-quality professionals and a group of experienced technicians. Zhongwei technology has a complete production line and equipment, covering mold manufacturing, injection molding, stamping, hardware baking to product assembly. The company has a professional product development technology center, with a large number of senior designers in the industry, with complete production capacity, such as product development, structural design, mold manufacturing, development and so on. The technology, quality and details of the product, from the original product design, raw materials procurement to mold development and production and after-sales service, have maintained high attention and strict requirements. We are committed to providing customers with the most diverse, cost-effective, best quality products and services. All along, our products are well received by customers at home and abroad. Our products have been continuously praised by customers at home and in some Asian countries and regions such as Europe and the United States. Zhongwei people uphold the company's philosophy of "quality first, service first, customer first, pursuit of excellence", and constantly strive for better, faster and better quality service.